Do you have the nasty habit of knocking your laptop around? Meet Acer's tough-as-nails Chromebook 11 N7, designed to withstand a serious beating. The Chromebook 11 N7 has an 11.6-inch screen and is fortified with layers of protection to withstand drops. Acer has been so meticulous in ruggedizing the laptop that it's even difficult to remove key caps from the keyboard -- whether by accident or on purpose. Why did Acer construct such a Chromebook? It's targeted at educational institutions that issue laptops to students, who may be clumsy with PCs. The Chromebook 11 N7 is certainly more durable than the iPad, which has been given to students and can crack easily if mishandled. The laptop will ship in North America this month starting at US$229.99. It will ship in Europe, Middle East and Africa next month starting at €299 (US$315). The Chromebook 11 N7 can withstand drops of up to 122 centimeters thanks to a reinforced casing around the laptop. It has been tested to the U.S. military's MIL-STD 810G standards, a specification used by PC makers to measure the resistance of laptops to harsh environmental conditions, drops and shocks. The laptop also has its own internal gutter system that drains out liquid spilled on the keyboard. The goal is to protect the internal components, and the laptop can withstand a spill of 330 milliliters of water, which is the amount of liquid in a soda can. Other laptop makers like Lenovo and Dell have similar gutter systems on keyboards. It weighs roughly 1.35 kilograms and offers 12 hours of battery life. Support for Android apps will come to the Chromebook in a few months, Acer said. But while the durable design is solid, and the low price appealing, the Chromebook lags on technology. It has Intel's year-old Celeron N3060 chip, which is based on older Braswell architecture. Intel has since started rolling out newer Celeron and Braswell processors, code-named Apollo Lake, to replace the older Braswell chips. The Acer Chromebook 11 N7 will come in two models -- the C731T, which will have a touchscreen, and the C731, which won't have a touchscreen. The screen resolution is 1366 x 768 pixels, which feels outdated as many PC makers are including full HD displays in entry-level laptops. The laptop has up to 32GB of eMMC storage, and up to 4GB of memory. It also has two USB 3.0 ports, an HDMI slot, an SD card reader and a 720p webcam. It lacks a multipurpose USB Type-C port, now appearing in many new laptops for charging and hooking up monitors and external storage. Wireless connectivity options include 802.11ac and the older Bluetooth 4.0. Many new laptops are getting Bluetooth 4.2 and chipsets now include Bluetooth 5.0. 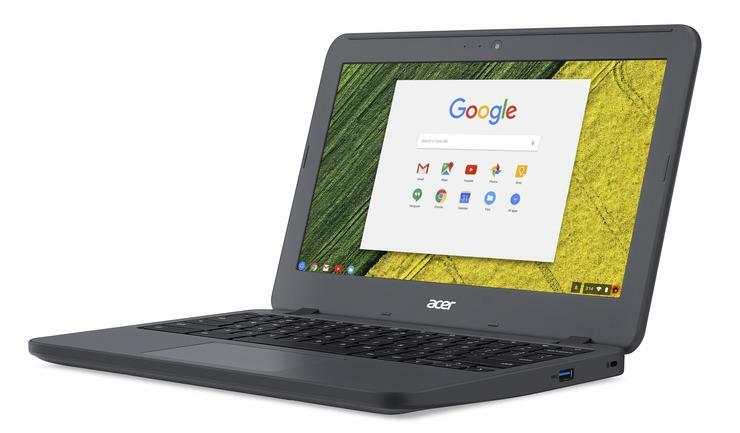 Acer's had success with Chromebooks, which are gaining in popularity in educational institutions. Google originally positioned Chromebooks as a replacement PC for Windows, but Chrome OS hasn't caught on yet with consumers. Chromebooks are mostly for those doing computing online and who don't need a full-fledged OS on their computer.